I'm the guy who started Two-Heel Drive, A Hiking Blog, in the fall of 2005. I started out in the San Francisco Bay Area - hiking all the wonderful trails in the nearby hills and venturing out to Sierra Nevada, Yosemite, Zion and the Grand Canyon-before moving to North Carolina in 2009. 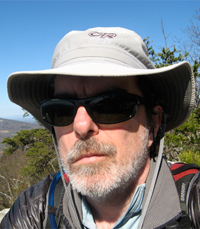 I've hiked all over the Blue Ridge Mountains and the lesser peaks of the Carolina Piedmont region, always on the prowl for the next waterfall or hundred-mile vista. Incidentally, I worked as a newspaper editor for over 20 years, so I've got a pretty strong get your-facts-right sensibility. Getting to the bottom of shopping for pants, shorts and underwear.